They’ll get the Pete’s Dragon reboot right eventually. At last. The Third Experiment! Seriously needs a “WTF” tag. I mean, a dragon wearing clothes (particularly a toga–must be hell for flying)? I assume these guys don’t breathe fire. But at least our delicate sensibilities are spared the risk of seeing dragon goolies. If I was in authority that dragon would be forced to wear the pants, belt, and boots. @Francis – On weekends he and his friends see whether their lungs or their 6.7L Power Stroke diesel F-350s can roll bigger coal. He’s not wearing clothes. That’s a human bib. Snacktime! Amateurs! This is how you do it. And now Google thinks I want to buy a Dodge Ram. Now that is some serious smoke! Allow me to throw my support behind @Longtime_Lurker’s request for a “WTF” tag. The sheer mindboggling nature of this image means it truly deserves one. On a side note, I suspect that’s not a real dragon, but some kind of robot. I don’t want to know what kind of real dragon would deign to wear a toga. You can tell he feels weird about the toga. Notice how stiff and uncomfortable he looks. Or maybe he’s just socially awkward and doesn’t know what to do with his arms. Judging from the dragon’s hands, I think the artist left out the newspaper that he was reading. We have this one here at chez noob. 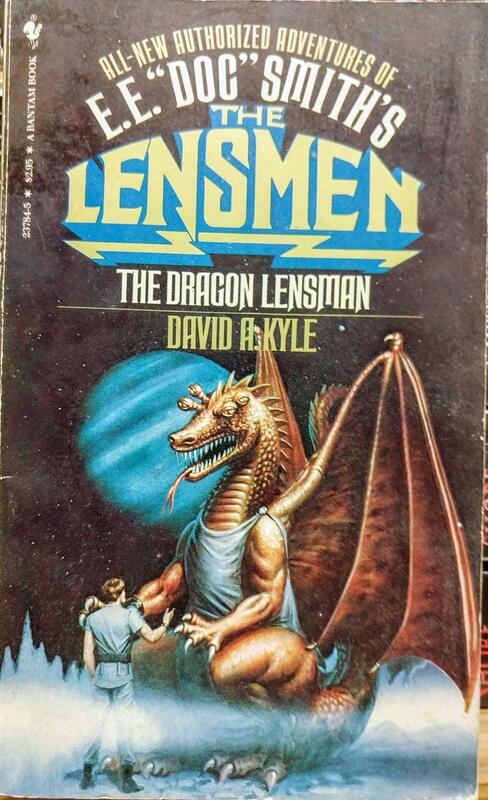 I don’t think the character wore a tunic, ever, just his lens. Which is supposed to be between his many eyes. He’s an alien, not an actual dragon. Is the guy on the cover repeating the old fannish joke “(The author) says you can’t sit here”? All the text is in one font — such a nice change — till they had to go all stupid on LENSMEN.